Whatever your edible passion - farm to fork; organic; grass-fed lamb, beef, venison from pen to plate; fresh, conscientiously harvested seafood; heritage fruits and vegetables; artisan-crafted cheeses and sauces; unique flavorings; olive oil so good you want to eat it with a spoon - it's found on the tables and in the markets of Hawkes Bay, the fruit and vegetable basket of New Zealand. Not to mention the wines and beers to accompany it all. 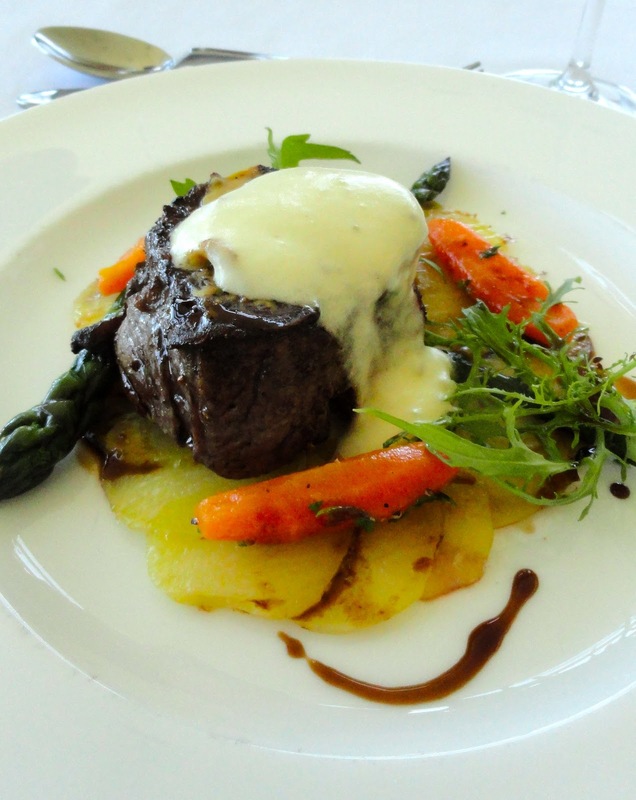 Start with the wineries, where you won't go wrong dining in the vineyard bistro. At least eight have established restaurants and even more offer platters and gourmet fare in their cellars. Smaller facilities may be open only in spring and summer - Oct.-Feb. - and have restricted hours. You can find out details at Hawkes Bay Winegrowers Inc.
At Elephant Hill our luncheon began with home-made breads, marinated olives, balsamic and olive oil, continued on with beef filet, Dijon roasted with truffled Parmesan foam and potato carpaccio, or baked whitefish with orange and radish salad, beluga lentils and verjuice nage, and ended with a superb shortbread and lemon tart with lemon sherbet and lemon confit. You'll soon find the dessert recipe at Food Afar - Recipes from a Travel Writer. Blackbarn's bistro was equally impressive. If the weather's good, snag a table outside under the arbor. After a superb lunch we had the perfect dessert - freshly picked strawberries, sorbet and creme fraiche. Spiced venison shortloin at Terroir. Terroir at Craggy Range put together a memorable progressive dinner with starters on the patio, dinner - Fennel crusted scallop; Beetroot cured Hawkes Bay kingfish with cuttlefish, chilli, mint and wild rice; Spiced Firstlight venison shortloin, Terroir garden Jerusalem artichokes, mushrooms and cassis prunes - in the cellar, followed by Lemon thyme semi-freddo, gingerbread and rhubarb confit before the restaurant's centerpiece fireplace. Note: To see what Terroir's chef does with the catch of the day, go to Food Afar - Recipes from a Travel Writer. At a party in Napier, I was introduced to some of the local products and their creators. • Chef Noel Crawford's award-winning Aromatics Mushrooms and sauces. • Richard and Joanie Williams' Origin Earth's pot set yoghurt and creamy cheese, especially the rinsed rind. • Wayne Startup's The Village Press olive oils and balsamic, which I had to bring home! • Orcona Chillis and Pepper sauces. • Firstlight's amazing meats - the venison's to die for. • Lime Rock and Sileni Estates wines. These and many other worth-the-trip edibles can be found at the weekly Hastings Farmers Market, New Zealand's oldest, every Sunday. This was one of my favorites, where you'll find 56 vendors every week and up to 75 at the height of growing season. 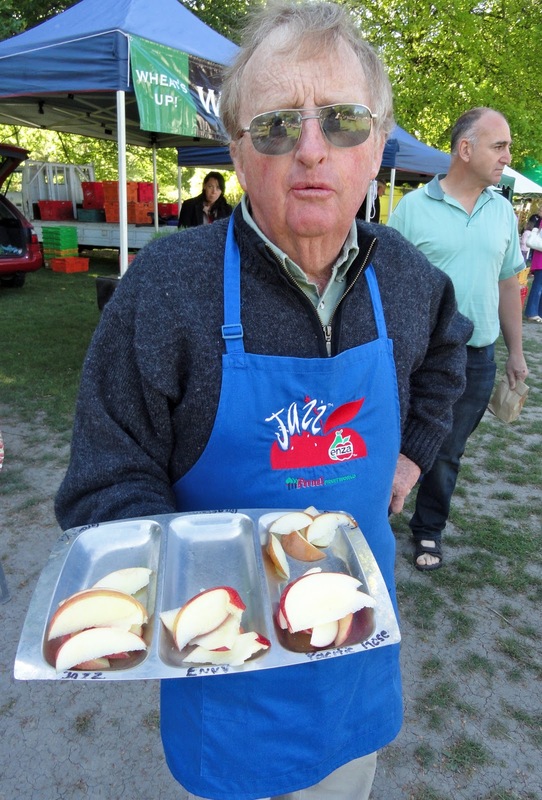 Here I met David Mardin, the apple man with his heirloom varieties. 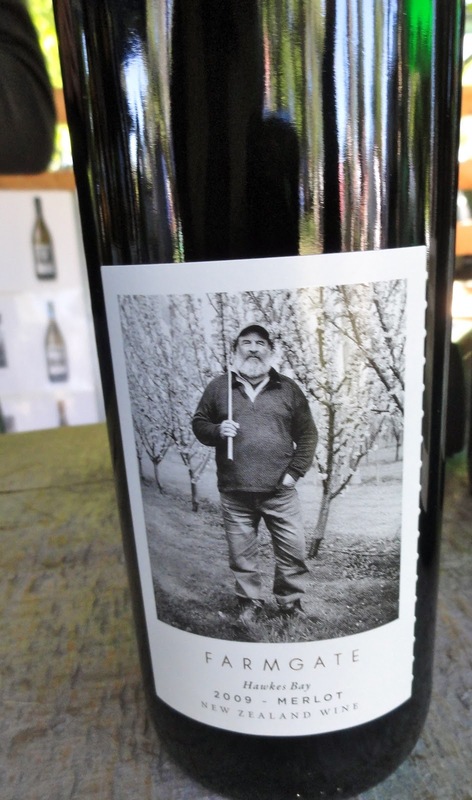 Then winemaker David Gough of Farmgate Wines who labels his bottles with photographs of the people who grow the foods that each particular wine goes with. I spent much time indecisively tasting and trying to narrow down to three The Village Press olive oils to buy. Sampling your way around the field filled with musicians playing and families picnicking is a most enjoyable way to spend a few hours. 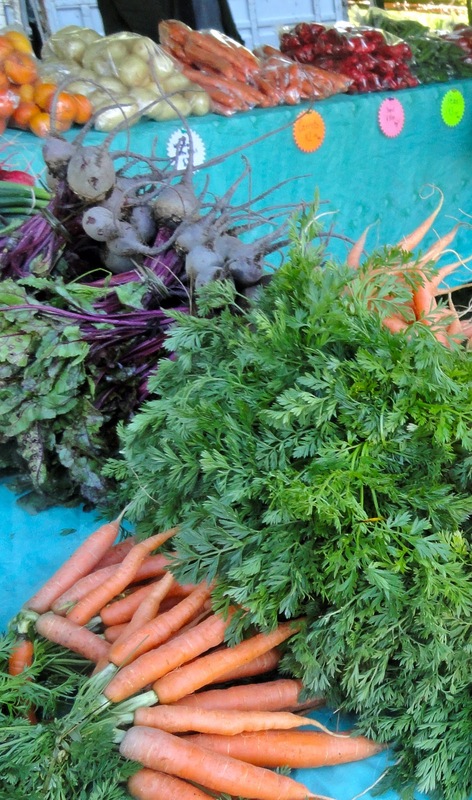 Tip: The Farmers Market is on nice flat ground. You'll walk but it's easy. The Farm at Cape Kidnappers was named the best hotel for food in Australasia and the South Pacific by Conde Nast Traveller, UK, in its 2012 Gold List, The World's Best Hotels, and it didn't take long to see why. I was fortunate enough to spend the night at this epitome of rustic luxury with one of the best golf courses in the world. Didn't play golf but did revel in the wonderful food produced the chefs. Salad of vine ripened tomatoes, Clevedon Buffalo mozzarella and balsamic vinaigrette. Hawkes Bay natural lamb loin and thyme vegetables. A mouth-watering lemon meringue pie with vanilla ice cream and limoncello shortbread. Breakfast was no less impressive. Tip: Depending on your accommodations here, you could encounter multiple steps and changes in elevation. Golf carts are available to take you door to door; just ask. Milk and Honey's sweet breakfast treat. Speaking of breakfast, had two outstanding ones in Napier, neither of which will tax the budget. 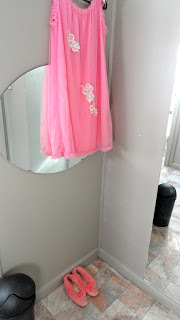 My first night I spent at the five star Crown Hotel in the oceanfront village of Ahuriri. Milk and Honey, the adjacent cafe, produced the most delicious pancakes topped with grilled bananas and blackberries. Tip: You can use elevators in the Crown to avoid the steepish hill down and up to Milk and Honey. The Kitchen Table, attached to the Photographers' Gallery in Napier's Art Deco district, serves up inventive fare with a sense of humor and a warm welcome. The ladies room is an homage to the '50s, the big communal table is filled with fun books and the breakfast is hearty and heavenly. I succumbed to the Orange French Toast with orange marmalade syrup. 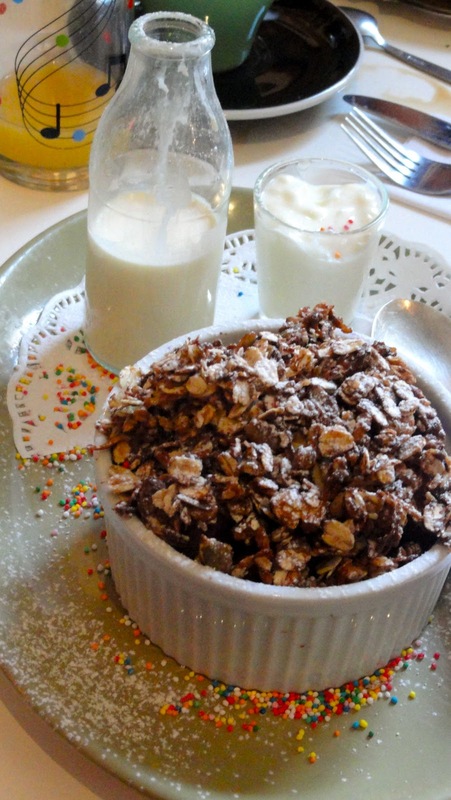 A friend who decided to dine light ordered a side of granola. Hah. For an entirely different experience take a Waimarama Maori tour that includes a Food of the Chiefs' array of native dishes, their significance and how they evolved. 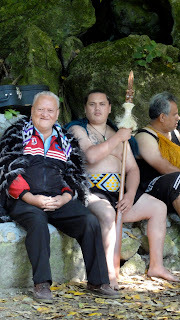 The Maori culture is fascinating and the Waimarama Maori descend from greater Rangitane tribal group, the first Polynesian explorers to arrive in New Zealand. You'll go to Hakikino, a once heavily defended fort, learn about the customs, the legends, the life and the food, which you'll try at tour's end. Much of it won't be impressive to Western palates accustomed to salted and sugared flavors but it's a great insight to the culture that shaped much of the country and gave the world champion Blacks rugby team its signature, intimidating dance of challenge. Tip: You've got a hike up and a hike down, plus steps if you want to see the eel fishery closeup, but you can ask for a ride up and down the hill if you need it. Wherever you go in Hawkes Bay, you needn't be hungry or thirsty for long. 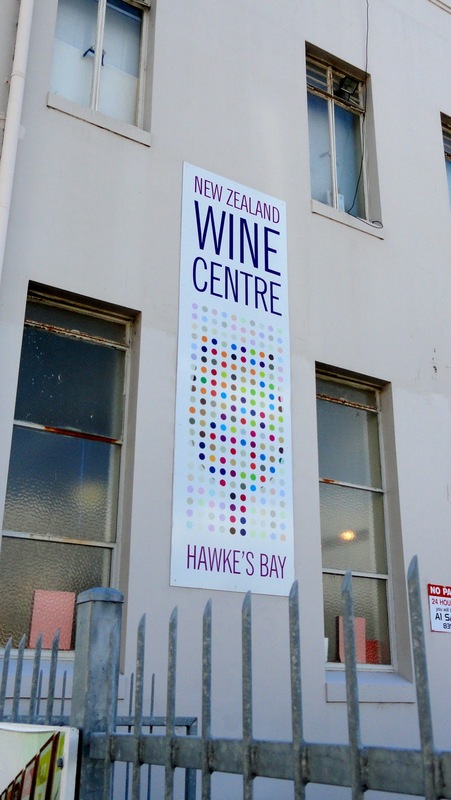 Where is Hawkes Bay and what else can I do there? Hawkes Bay is the central east coast of New Zealand's North Island about 262 miles south of Auckland, 192 miles north of Wellington. In between sampling the area's fine wines on the Wine Trail, visiting the one-of-a-kind Wine Centre (see previous postings at this site) and dining on its wonderful fresh foods (previous post), there are many ways to fill your time with fun. Tip: Kiwis, adrenaline addicts and dedicated hikers, will suggest you hike (beware of the "It's just a little uphill" or "an easy bit of a walk;" it won't be), fish, kayak, camp, climb or bike. They are a hardy, hospitable bunch and want you to enjoy their country the way they do. These are stops more our style, Levelers. 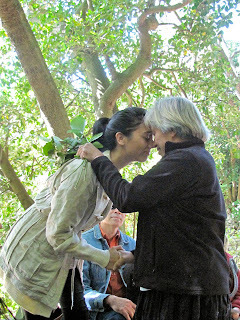 If you've ever dreamed of wandering in a magical woodland garden, this will fill the bill. Begun in the 1860s by ASG Carlyon and his wife who missed Tregrehan, the family homestead and its gardens in Cornwall, the 20-acre expanse is a wonderland of nature's beauty. Oaks, ash, pines, magnolias are growing into their second century. 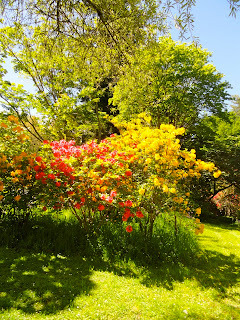 Rhododendrons, azaleas and camellias tower over you in a riot of color. Bluebells, daffodils, rare Himalayan lilies and forget-me-nots carry the palette to the ground and in between, roses bloom effusively. Phyllida and Stuart Gibson (she's the fifth generation Carlyon) moved into the house in 2008 and now welcome visitors to their garden and overnight guests into three upstairs en suite rooms. The food is grand and the Gibsons are as much fun as they are fascinating, especially when they tour you through the house telling tales from its history. Tip: The gardens are easy walking with minor elevation changes. The stairs are broad with bannisters and a landing; about as easy as you can get to a second level. If you're into history there's a Heritage Trail that starts with Gwavas Garden and goes through the Ongaonga area of central Hawkes Bay. The Art Deco capital of the world is well worth a day of your time, if not more. 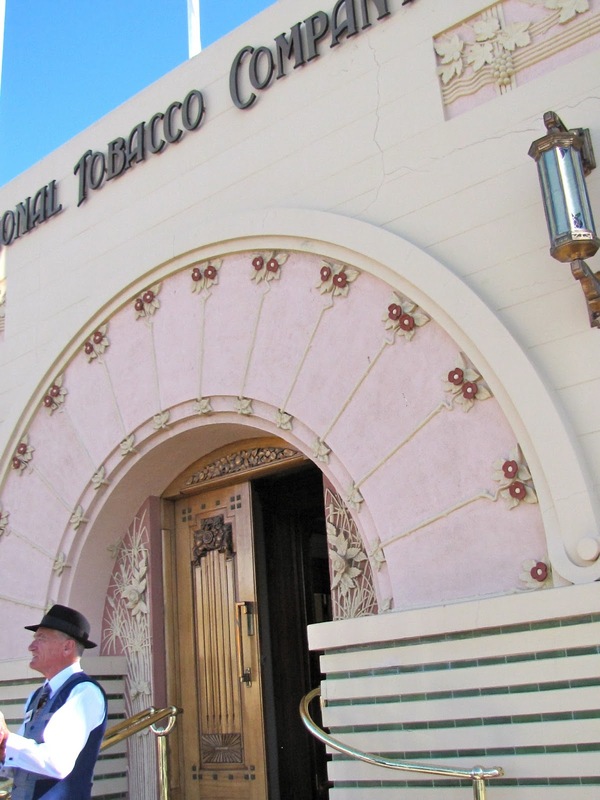 You can take a guided walking tour - the historic district is flat - and learn how this town rose from the ashes in two years and how to spot Maori motifs that make the designs unlike those anywhere else. I loved the classic car art deco tour where we donned boas and headache bands from the '30s, piled into period Packards and began our journey back in time at the National Tobacco Co., an architectural gem of Deco, Art Nouveau and very personal tastes. You can easily spend an hour or more browsing through the Art Deco Trust building. I wish I'd made time to stop in at Opossum World and the National Aquarium of New Zealand. See a rugby game at McLean Park and cheer on the local Hawkes Bay Magpies with a hearty "C'mon the Bay!" This city, slightly larger than Napier, was also devastated by the 1930 earthquake. Its architecture is more Spanish Mission than Art Deco. In addition to the delightful Sunday Farmers' Market (see previous post), hit the horses with the New Zealand Horse of the Year show in March or the races at Hastings Racecourse. 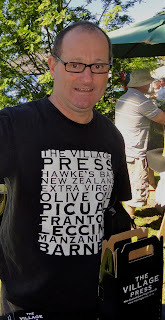 Its suburb, Havelock North, is a small boutique and food town with neat shops and a great food market. Don't miss the public toilets in the town center park. By all means experience Maori culture with a Waimarama Maori tour to Hakikino (see previous post on this site). No shortage of sheep anywhere in New Zealand. Wool World at Clifton Station, Te Awanga, is another spot I missed but by all reports it's a fascinating exposure to a historic, 2,000-acre sheep station. Go to the birds with Gannet Safaris. Even if you don't give a flip about the winged ones, it's quite an experience and the views of Cape Kidnappers are spectacular (see 12/30/2011 post on this site). 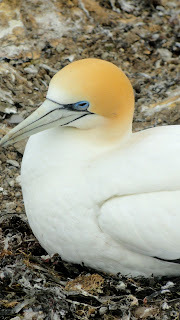 View from the gannet colony. I visited Hawkes Bay with a small group of Society of American Travel Writers members and Hawkes Bay Tourism selected where we would stay. However, I was pleased with them all. You will find most rooms, sometimes even in fine hotels, come with efficiency kitchens. 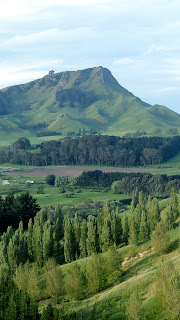 Kiwis are big do-it-yourselfers and love to travel so they often cut corners where they can. It comes in handy for us Yanks too. 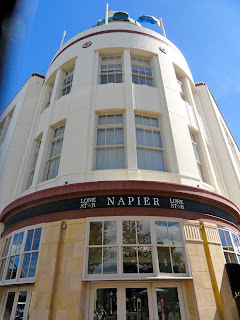 In Napier, I can recommend The Crown Hotel Napier overlooking the waterfront in Ahuriri. The room was large, handsomely furnished and scrupulously clean. I also stayed at Quest Apartments in downtown, which I can also recommend; four-star rooms in a historic 1919 Spanish Mission style building. However, I fell in love with the luxe condo-style units in the Dome Penthouse Apartments. You'll love the ocean view overlooking the Marine Parade and it is the downtown location. If your pockets are deep, treat yourself to a stay at the spectacularly sited The Farm at Cape Kidnappers, Te Awanga, one of New Zealands most honored luxury lodges. Trust me, you won't want to leave. Tip: Levelers, to avoid stairs, ask for accommodations close to the lodge. I don't know if I've convinced you to go to Hawkes Bay but I've convinced myself to return. Napier is an off-the-tourist-path, Art Deco gem on New Zealand's North Island and perfectly located for touring the Wine Trail and indulging in fine dining. With a population of 54,000, it's easy to get around downtown as well as touring north, south or west (east gets you wet; Napier is on the Pacific ocean. The earthquake that devastated the city in 1931 turned out to be a good thing, as Martha Stewart would say. • In some 60 seconds it produced "The Gift," 8,500 acres of land that suddenly rose nine feet from the sea. 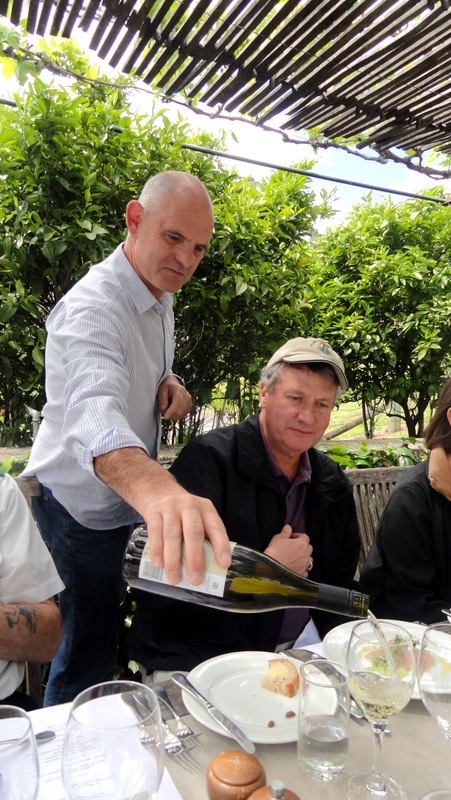 • It moved the Ngaruroro River off its course, leaving behind the gravely riverbed, Gimblett Gravels, perfect for growing the grapes that now produce 70 percent of the country's red wine. • The massive reconstruction was done in the cheapest, most durable style, Art Deco, giving it the largest concentration on Art Deco architecture and matching it with Miami's South Beach as a Mecca for architectural historians. Tip: Few building are over two stories high and those that are all have elevators. Downtown Napier is flat but its residential areas are on steep hillsides. The wooden Victorian homes perched up there are the only things to survive the earthquake. All in all, it added a silver lining on one of the world's most beautiful landscapes, the fruit bowl of New Zealand and one of the best wine-growing regions anywhere with more than 150 vineyards and 90 wineries. Our Church Road wine-tasting line up. 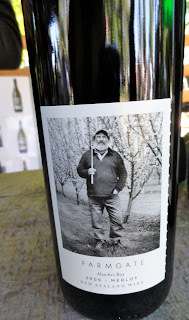 I began my wine trail, heading north of Napier to the 114-year-old Church Road Winery where the late Tom McDonald, considered the father of New Zealand red wine, developed some of Hawkes Bay's best. Crews were setting up for a Steely Dan concert in a few days as we toured the facility and its fascinating wine museum, the only one in the country. Lunch and tasting followed in the elegant Tom McDonald Cellar and yes, "Old Tom's" reputation is deserved and his legacy lives on. Tip: Steps here are minimal, although you will encounter a few in the museum. 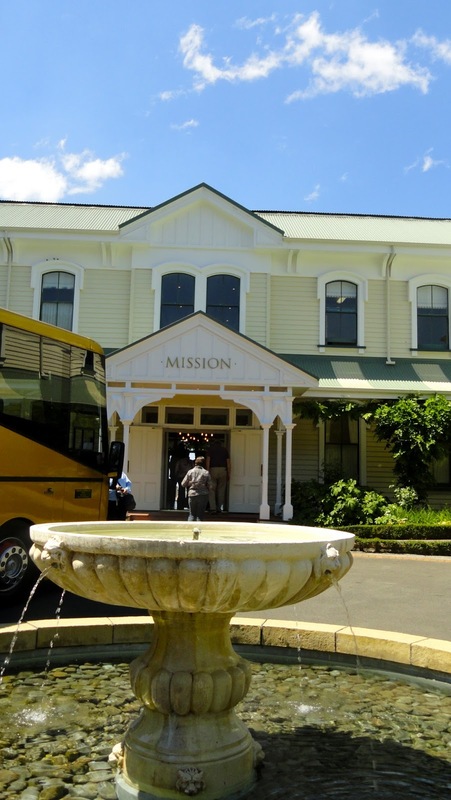 Just down the road toward Napier I stopped at the country's oldest winery, Mission Estate, founded at a Marist Mission in 1851. The building is a restored seminary and the grounds are striking, from the 60 plane trees, 100 years old, lining the driveway to the views across the back lawn to vineyards. View from the Mission Estate back lawn. The restaurant here is quite popular, but I was too full to test it. While Church Road bottles middle to high end, Mission Estate wines are more in the middle range. Tip: No steps to speak of here either. Blackbarn Vineyards, south of Napier toward Hastings, is a boutique vineyard whose wines are all estate grown and hand picked. Luncheon at Blackbarn was a treat. 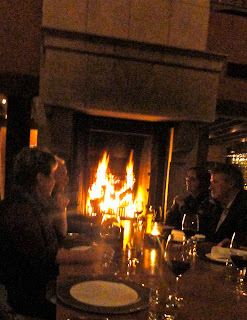 Built on a natural amphitheater where concerts are often held, Blackbarn has a superb bistro. If you fall in love with their wines (as you probably will), they don't export but will ship. Like a number of Hawkes Bay wineries, Blackbarn has luxury accommodations as well. Tip: A few steps down to the arbor level where I ate but not worth counting. View from Giants winery terrace. That night I attended a memorable tour and progressive dinner at Craggy Range's Giants Winery south of Napier. 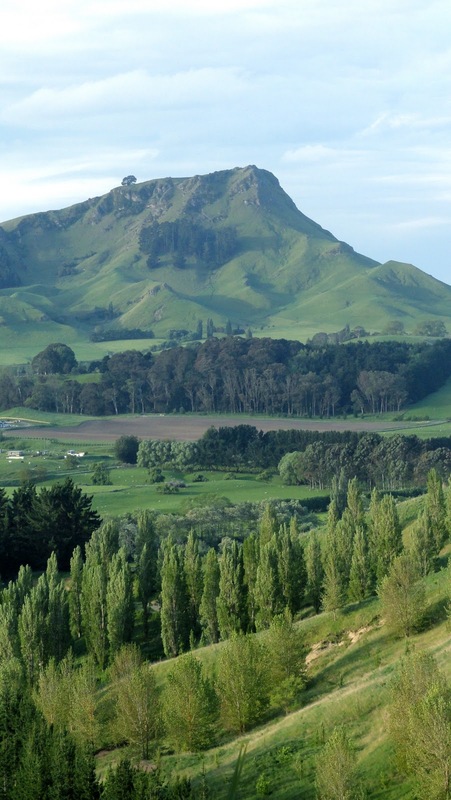 Its dramatic setting along the Tukituki River and Craggy Range looking at Te Mata Peak will have you agog and snapping photos left and right. Dessert before the fire at Terroir. from Gimblett Gravels Vineyard in Hawkes Bay and rich 2008 Craggy Range Noble dessert wine. Giants has luxury cottage accommodations, too. Naturally, there's an elephant in front of Elephant Hill. Elephant Hill, a winery estate south of Napier along the Te Awanga coast and Hawke's Bay's newest, is as contemporary as the others are atmospheric. A pool, vineyards and the Pacific Ocean - how cool can it get. The view's hard to beat - across vineyards to the Pacific - and the food is outstanding. Wines produced here, fruity and elegant, are all estate grown, hand-picked and fully accredited by the Sustainable Winegrowers of New Zealand. 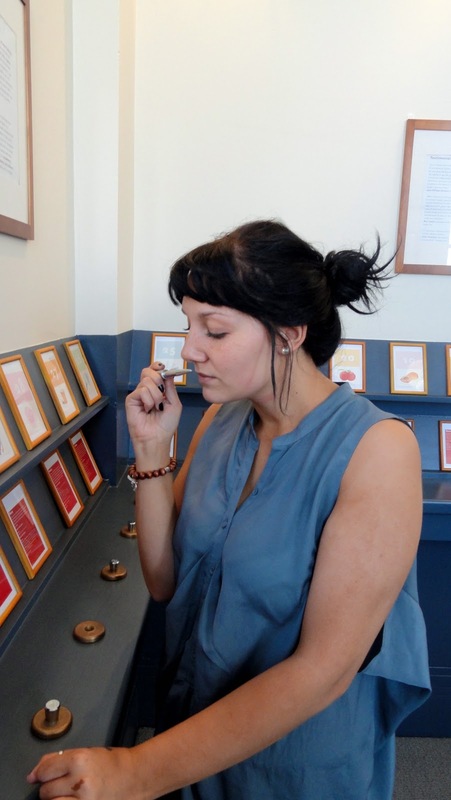 You don't have to leave Napier to gain an appreciation and understanding and especially a nose for wine. The New Zealand Wine Centre, the only one of its kind, is right downtown in the Art Deco District. The Wine Centre Market has everything you can imagine connected to wine. 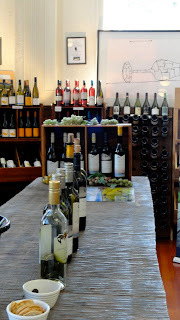 You can learn about wine making and get lost in the wine market and tasting room and a lot more. Many wonderful wines are made at smaller vineyards that don't have tasting rooms and you can find them here. I highly recommend The Wine Adventure there, during which you test your nose on good and bad smells found in wine in the aroma awareness room (I flunked nose) and sample six wines (you choose reds or whites) from Hawkes Bay vineyards after watching a 20-minute film of insights from the vineyard owner or winemaker. It's a real eye or rather, nose opener. ... then test yourself on a flight of whites - or reds. I barely whiffed the surface of Hawkes Bay vineyards and never got to those in the Marlborough area, but that gives me an impressive to-see-and-do list for next time. Next post: The food of Hawkes Bay.